I've spotted a few blog reactions to last week's datajournalism meetup in Berlin, and thought I'd gather a couple of them here. "It was good to see the value of the data for the general public was in the foreground, and not financial interests playing the lead role." "I'm not at all an expert but data protection always warns against large, central databases"
As someone on the day in Berlin said: "We've given a lot of information to the state before in Germany. That didn't turn out so well". "The Guardian and BBC are already making large parts of their data sets available Google Spreadsheet, placing them in a media competitor. The speakers from both institutions stressed in their speeches again and again the real value added by making this data available with open and transparent access. From a German perspective I think we should trust the experiences of these two great media institutions, and some of us venture out from the hiding place into which we have partially retreated this summer with Google Street View." Finally, Simon Hopkins of Unthinkable Consulting wrote about his experience of the day. 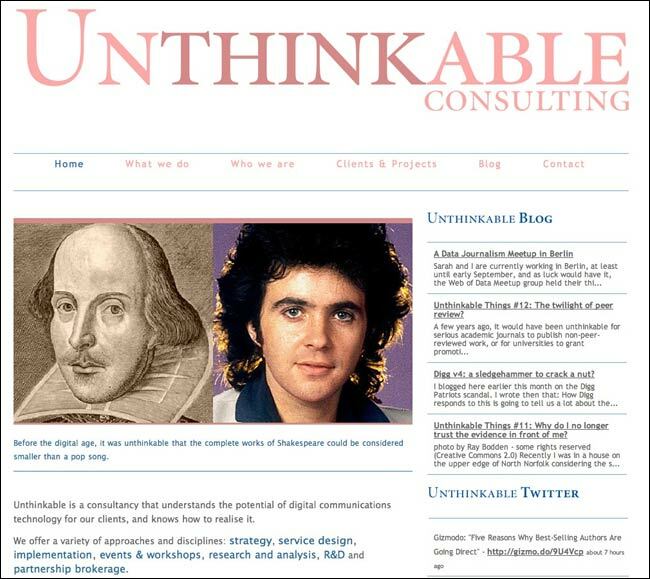 And you can't argue with a consultancy whose homepage picture carousel occasionally throws up a juxtaposition of seventies pop god David Essex and the somewhat more critically acclaimed William Shakespeare. "Political scientist Ole Wintermann of The Bertelsmann Foundation's Future Challenges sounded a slightly cautionary note among the enthusiasm. It's all well and good the media – and hence both the public and civil society in general – having access to unprecedented amounts of data, but inferring causal meaning from data, be it about, climate or demographics, remained a huge challenge. In a moment somewhat reminiscent of Neville Brodie's recent appearance on Newsnight, he was especially scathing about the reliance of journalists and policy makers on infographics to communicate ideas without really examining substance – especially substance in terms of causality. Sarah Turner and I both felt it was one of the most adroit interventions of the afternoo." By Martin Belam on 7 September 2010.